Toasted, roughly chopped nuts - 2-3 table spoons. I have used a mix of almonds, cashew and peanuts. Bring the cream along with butter to a boil in a small saucepan, on low heat, stirring all the while. Be careful not to burn the cream. Take off the fire. Add the chocolate chips and stir in gently till you get a smooth emulsion. Keep aside. If the mixture hardens, heat carefully in short spurts in a microwave till warm and it reaches liquid consistency. You could also make this sauce ahead and refrigerate till needed. You will again need to heat to regain the consistency. To Serve: Pour 2 teaspoons warm chocolate sauce in a dessert glass. Scoop the vanilla ice cream on it. Pour more sauce over the ice cream. Top with nuts and serve immediately. If you happen to have some chocolate cake in your freezer, that would be a fantastic addition here. Please note: Make sure the ice cream is well frozen as it will melt a little when you pour the warm sauce on it. You can see mine melting as hubby put the ice cream in the fridge instead of the freezer:-( . mmm yummmyyy dessert, love this chocolate sauce version..how many days can it be stored? will definitely try. 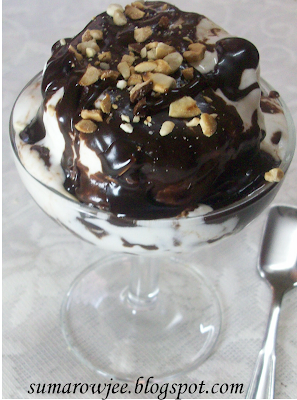 This looks so good that I am drooling over the thought of this chocolate sauce topped on vanilla ice-cream. One of my all time favorites. I must have had dozens of these in Corner House, paying huge! Now we can make them all at home! Corner House Hot Choc Fudge has been among my all time favorites too! Do try making this at home and am sure you will like it. so tempting dessert!! loved ur version of chocolate sauce!! Love anything chocolate so this one is definitely a winner in my book. Anything chocolaty ...and am in for it.LOvely! I love how quick and esy this is Suma... Lovely!! Home-made Piping Gel recipe - Yessss! We Can!! Eggless Chocolate Cake - A Successful First! !